The Temporomandibular Joint (TMJ) is the joint that connects the upper and lower jaw. The temporomandibular joint allows you to speak and chew without restriction. When there is dysfunction in the TMJ, you may hear Dr. Cavallo refer to it as TMD (temporomandibular disorder). 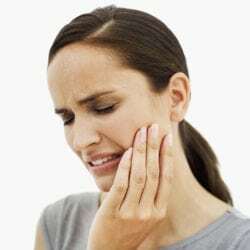 For some patients, TMD may cause slight discomfort; for other patients, TMD may result in painful or uncomfortable symptoms. Statistically, TMD can be difficult to diagnose because TMD symptoms may mimic other health concerns. Dr. Joseph Cavallo has undergone extensive postgraduate training for TMJ disorder and other complex bites disorders. Dr. Cavallo offers personalized solutions to treat patients with TMJ disorder. Dr. Cavallo will review your medical history and perform a full comprehensive exam before recommending the appropriate treatment. Dr. Cavallo will also perform a full bite analysis to determine if there is an imbalance in the bite. During the bite analysis, Dr. Cavallo utilizes a machine called an articulator. An articulator It is a records your biting/chewing motion on a device that mimics your natural jaw movements. Your treatment will depend on the severity of your case and the extent of damage the teeth have sustained. The most common treatment solutions are TMJ Mouthguards and Bite Correction Procedures (Occlusal Equilibration). The goal of treatment is to alleviate painful, uncomfortable symptoms and prevent further damage to the teeth and jaw. If you are seeing relief from TMJ pain, schedule a visit to our Woodbridge, VA dental office. Der. Cavallo is an experienced dentist in Woodbridge, VA dedicated to improving the health and function of patient smiles. Dr. Cavallo can work with you to find the right treatment for your dental health. To learn more about our services, contact our Woodbridge, VA dental office. To schedule a consultation, call 703.493.1203 or schedule a consultation online.